Dhaval N. Sorathiya, Prof. Jasmin Gadhiya and Prof. Abhishek Raturi. "Review on Behaviour of Diagrid Structural System in High-Rise Building ." Journal 4 Research 2.11 (2016): 1-4. Shiwani Gupta. "A Survey on Search Engines." Journal 4 Research 2.11 (2016): 5-9. Kedar Bhagwat Baburao, Kedar Bhagwat Baburao and Gulave Jayshri Sayaji. "Acoustically Induced Vibration (AIV) & Flow Induced Vibration (FIV) Analysis for the High Pressure Reducing Systems using Energy Institute Guidelines." Journal 4 Research 2.11 (2017): 10-13. Udhayakumar. T and Dr. K.Prabhakar . "India -Chennai E-Waste Handling Survey 2016." Journal 4 Research 2.11 (2017): 14-19. Regidor-111 Dioso, Kaluwanchikudy Judenimal and Gopalasingam Arunaj. "A Comparative Study Between Topical Povidone Iodine and Normal Saline Solutions as Wet-To-Dry Dressing for Wound Lacerations / Abrasions Among Adult Patients." Journal 4 Research 2.11 (2017): 20-24. Patel Kajalben Ramanbhai and Prof. S. P. Patil. "Design and VHDL Implementation of 64-point FFT using Two Structure 8-point FFT/IFFT." Journal 4 Research 2.11 (2017): 25-33. Jenish Patel, Krishna Kshtriya and Dr Sanjay Vyas. "Technique to Reduce Dump Load in Isolated Hydro Power Plant by Load Frequency Control." 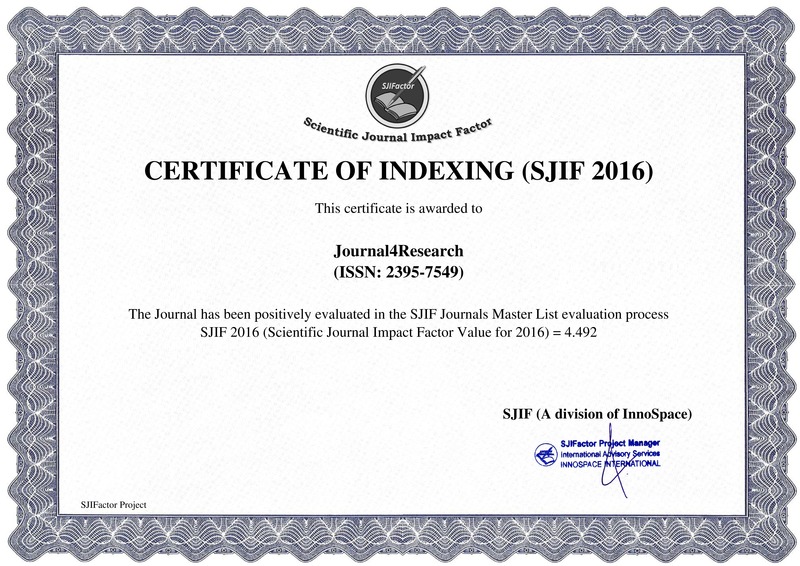 Journal 4 Research 2.11 (2017): 34-39.